Every morning, the fine folks at Sports Radio Interviews sift through the a.m. drive-time chatter to bring you the best interviews with coaches, players, and personalities across the sports landscape. 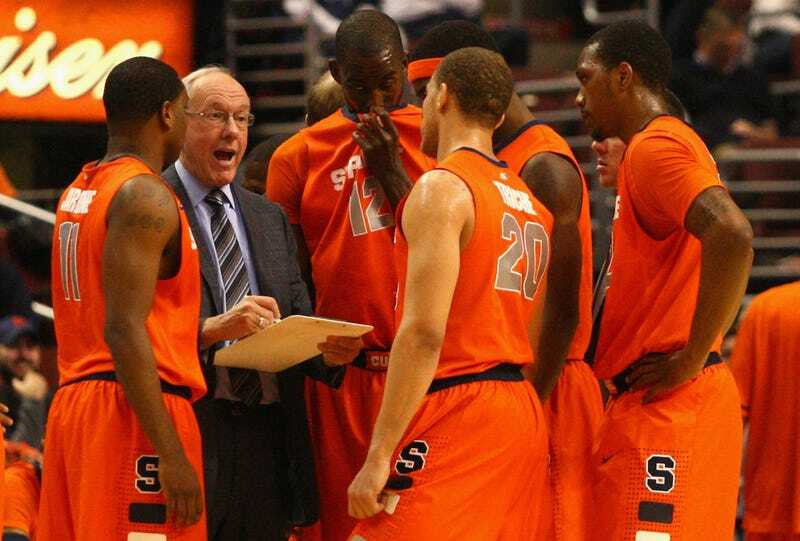 Today: Boeheim says Syracuse is just one of many potential champs. Jim Boeheim joined ESPN New York with The Michael Kay Show to discuss if he's caught up in Linsanity, why the worries about Carmelo coming back the dumbest thing he's heard, if there might be any chemistry issues at first between Anthony and Lin, if Anthony and Amar'e Stoudemire can succeed together and whether his Syracuse team is good enough to win a national championship. "I caught a couple of the games that were on ESPN or TNT somewhere, so I did get to see him play. Obviously he's a good player. He may not be a 25-every-night player like he's doing now, but he looks like a good player and makes good decisions and it's been fun watching him play. It's a great story and we have to wait a little while on time and everything to see how it plays out, but it looks to me like he's definitely a good player. He's playing for a coach that's good for point guards. With Amar'e coming back and then Carmelo, he's going to have two more weapons, and I think that's something that will be good." "I've got to be honest with you, with all the things I've heard over the years, and you hear a lot of crazy things, this is the dumbest I've ever heard. He won a national championship playing with guys here and took shots, but didn't dominate the ball. He won on the Olympic team and didn't dominate the ball, so he's proven he can play with guys. I think sometimes in Denver he was put in position where he had to make plays, but he's always shot a good field goal percentage. … Nobody's ever said Kobe dominates the ball, I guess, or LeBron or those guys. Of course they do. The best offensive players are going to have the ball. I think the point guard situation will help Carmelo and help Amar'e because it gives them somebody to make plays." "He's already proven that he can play. Great players can play with anybody. I think that's fairly common sense and he is a great player. I think his defense has gotten better. I think the whole key for the Knicks is going to be their defense getting better. … Their offense is fine. They've got to get the defensive end better. … The one thing looking at Jeremy Lin, is his defense going to be good enough when he plays the Derrick Roses and the Westbrooks and the Chris Pauls. That's the question that's got to be answered." "No, that's what point guards do. This is what I don't understand. He's got another weapon coming back. This is a great thing. Instead of passing the ball to a guy that's a questionable shooter, he's passing it to a guy that can shoot and score. I think an overlooked thing is I think Novak has helped this team because he gives them another shooter. … There will be no chemistry issue on offense whatsoever. Jeremy Lin's a good point guard. He sets people up, and the fact that he can score makes him a better passer." "There's a little bit, in my mind … I think he's got a good point there. Amar'e needs the ball in certain places. I think it can still work. I think he'll fit well in the pick and roll. … I don't think Carmelo needs help. He can get his own shot, he can post up or take the ball. I think that Amar'e might be helped more with a good point guard. They're not a perfect fit, I don't think … but I think it can work and I think Lin can really help that." "I think there's about 10 teams that think they're going to win the national championship this year and I think that all 10 of those coaches probably have a good shot at it. And that means you've got a 1-in-10 chance." So you're one of those 10? : "Oh yeah, we're definitely one of those 10. I just think that college basketball is so balanced. Last year, the two very best teams in the country clearly were Ohio State and Kansas and as I recall, neither one of them made it to the Final Four. … I like this team and I think we do have a chance." • Jeremy Lin says he's not Tim Tebow. • David Freese plays a lot of squash. • Tom Thibodeau is going to be more cautious with Derrick Rose.